Grand dream: Nadziruddin (centre) giving details of the planned resort development while Desaru Development Holdings One CEO Firdaus Azharuddin (left) and Themed Attractions and Resorts MD and CEO Tunku Datuk Ahmad Burhanuddin look on. KUALA LUMPUR: Desaru Coast, an up-and-coming development on the east side of Johor, will not only satiate the affluent's taste in luxury holidays but also the desire to own a holiday spot. The group behind the development, Destination Resorts & Hotels (DRH), said Desaru Coast would flourish into not just a luxury travel destination, but also a resort township for recurrent holidaymakers. “It's all part of our intention to make Desaru a resort township. The residential part of it will be more likely holiday homes or second homes for those who can afford it,” managing director Nadziruddin Basri told StarBiz. He believed that with facilities already available in a neighbouring township, the resort township would be able to leverage off the necessities rather than having another set of its own facilities. DRH is in partnership with UEM Land Bhd for its residential development in Phase 1. UEM Land owns 51% of the residential development, which will be a mix of mid- to high-end semi-detached houses, bungalows, villas and low-density condominiums. Nadziruddin noted that the residential component was still in its preliminary planning stage but the projects would be launched “precinct by precinct,” depending on buyers' responses and the economy. “There will also be a need for base population and this is when we look at Petronas' development in Pengerang, which would be complete about the same time as our Phase 1,” he said, noting that Petronas would likely bring in over 20,000 staff. “There will always be the need for housing so the potential is there, even if we can lock in 10% of its staff,” he said, noting the strategic location close to Singapore and Iskandar Malaysia. DRH, through subsidiary Desaru Development Corp Sdn Bhd (DDC), is also in talks with UKAS to obtain facilitation funds for infrastructure development. If obtained, DRH could get up to 10% of total infrastructure capex. It has already a RM600mil loan from Malayan Banking Bhd and a seed capital from Khazanah Nasional Bhd, its parent company. As for opening up equity ownership in some of the components, Nadziruddin said although it was welcomed, DRH would maintain a majority share in all projects carried out so that it ccould ensure the original luxury travel theme was always retained. “We want the whole area to blend in well with the concept of a luxury holiday. With the names we are bringing in, we are prepared to invest to maintain the township because the operators have no qualms moving out if we are not up to standard,” he said. Phase 1 will offer four premium resorts operated by Sheraton Resorts and Hotels, The Datai, Aman Resorts and another yet to be named for the plantation hotel. There will also be marine and water parks, Ocean Quest and Ocean Splash, which feature the world's biggest salt water wave pool. Phase 2 and 3 have yet to be finalised as DRH has decided to plan them according to market demand in the coming years. “We are a catalyst developer so we have to take a long-term view of the development,” Nadziruddin said of the 15-to-20-year timeline set for the three phases of Desaru Coast. “We have to make sure not to overdevelop Phase 1 even though our investment is big, because we need it to benefit from Phase 2 and 3 too,” he added. Desaru Development Holdings One Sdn Bhd is the operational vehicle of DDC to develop Phase 1. It is a 70:30 joint venture between Stulang Ventures Sdn Bhd and Permodalan Darul Ta'zim. Desaru Coast covers 3,900 acres along a 17-km stretch of pristine coast. The chief of Iskandar Investment Bhd (IIB) is bullish on the outlook for Iskandar Malaysia in Johor, attributing his optimism to various projects like the high-speed rail (HSR) plan and the transformation of Desaru. "Hopefully, it (HSR) can come earlier. Iskandar Malaysia will benefit from the MRT link between JB Sentral and Woodlands in Singapore," said IIB president and chief executive officer Datuk Syed Mohamed Syed Ibrahim. "The outlook from 2013 onwards will be strong within the context of Nusajaya and Iskandar Malaysia. We see some of the current developments coming up and investors will be submitting their plans for new projects," he told Business Times in an interview recently. Khazanah Nasional Bhd recently said plans are underway to transform Desaru, starting with Phase 1 that carries a gross development value of RM5 billion. The transformation will be carried out in three phases over 15 to 20 years. For the HSR, a study to link Kuala Lumpur and Singapore is being carried out by the Land Public Transport Commission (SPAD), which is expected to be completed by year-end. If found feasible, SPAD will call for pre-qualification bids by mid-2013. IIB, set up in 2006, is a strategic developer of catalytic projects in Iskandar Malaysia, the country's special economic zone. It is developing four clusters - education, driven by Educity; leisure and tourism, led by LegoLand; healthcare and wellness, with Gleneagles Medini Hospital being the key driver; and creative development, with Pinewood Iskandar Malaysia Studios the catalytic project. Syed Mohamed said the catalytic projects will generate substantial multiplier effects, triggering economic activities. "Without Educity, it would be difficult for any developers to enjoy the current pricing level. For the past 10 years, apartments in Johor were selling at RM300psf but UEM Land (Holdings Bhd) recently launched properties at RM700psqf," he said. 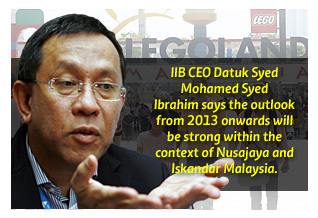 Syed Mohamed said growth for IIB is on the cards. By end-2012, the company is expected to ink six to seven new deals, including joint venture and land-lease purchase agreements. IIB currently has such agreements with China's Qingdao Zhouyuan Investment Holdings, Mah Sing Group Bhd and WCT Bhd to undertake projects worth RM2.5 billion, RM1.1 billion, and RM1.5 billion, respectively. 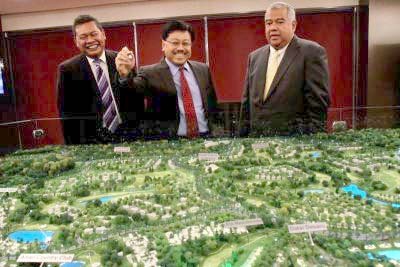 KUALA LUMPUR: Construction and property development company, WCT Bhd's share price rose one sen to RM2.75 following news that the company had acquired 7.33 hectares (18.12 acres) of land in Medini, Iskandar Johor, worth RM99.4 million. The counter, which moved between RM2.72 and RM2.75, saw 130,300 shares traded. The venture marks WCT's third property development project in the Iskandar region and is earmarked for a mixed commercial development with an estimated gross development value of RM1.5 billion. Kenanga Research said the acquisition is a positive move as WCT will be able to secure the earthworks job for the Tun Razak Exchange and the Refinery and Petrochemicals Integrated Development (RAPID) project in the near term. "We are positive on this acquisition and believe that it is the right time for WCT to expand its property exposure in the Iskandar area," Kenanga Research said in a note today. The research house has maintained its "outperform" recommendation on WCT with a higher target price (TP) of RM3.17 against RM2.74 previously. Hong Leong Investment Bank (HLIB) said earnings from this development are expected to kick in from financial year 2014 onwards. It also maintained its "buy" call on WCT with an unchanged TP of RM3.31. KUALA LUMPUR: Pavillion Real Estate Investment Trust has recorded a pre-tax profit of RM48.738 million for the third quarter financial period ended Sept 30, 2012. Revenue for the period was RM86.509 million, the company said in a filing to Bursa Malaysia today. It said an asset enhancement initiative announced in January last year has been completed with most tenants commencing trade from end of the quarter under review. This is expected to bring higher rental income for the next quarter, it said.